OTHNIEL CHARLES MARSH: The years following the discovery of Leidy's hadrosaur opened a new age of dinosaur discovery in America that is unmatched in the annals of paleontology. Although many people had a hand in finding new dinosaurs in this golden age of dinosaur discovery, the main impetus was due to two men, one of whom was Othniel C. Marsh (1831-1899), Professor of Paleontology at Yale University and founder of the Yale Peabody Museum (the other was Edward Drinker Cope). As the picture at left suggests, Marsh was at the acme of his career an influential, larger than life figure - for 12 years president of the National Academy of Sciences. Except for a boyhood hobby of collecting fossils from the Rochester Shale and other rocks near his Lockport, NY, home, Marsh's early life gave no indication of the direction his career would take as an adult. Rather than attend to the chores of the family farm, Marsh roamed field and wood hunting small game (he became an excellent marksman), and enjoying the outdoor life. As it turned out, the experienced gained in these boyhood wanderings was as important as his formal education at Andover Academy and Yale University, where his interest in geology and paleontology developed, and from which he graduated in 1860. During the 1860's, he continued his studies at Yale and at several universities in Europe (bad eyes kept him out of the Civil War). Marsh was also the nephew of the fabulously wealthy banker and philanthropist George Peabody. 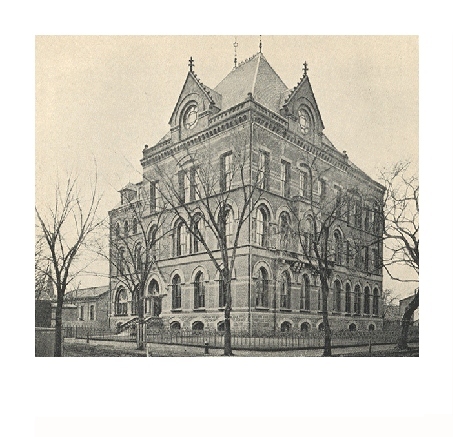 While in Europe Marsh convinced Peabody to establish at Yale a new natural history museum - today's Yale Peabody Museum, and to endow a professorship for Marsh at Yale in paleontology. The original building, the one funded by Peabody is seen at left. The University was glad to accept such largesse, and so while quite young, Marsh became a Yale professor. Although Marsh clearly benefited immensely from his uncle's munificence (there is no better example in paleontology of the old Pennsylvania Dutch adage that if you want eggs for breakfast and don't own a henhouse, then live on the farm of someone who does), it is important to note that Marsh had already established himself as a scientist of note through the high quality of his early publications; and, while he was still a student, he had won the respect of his Yale instructors, who were eminent scientists in their own right. They were happy to have him as a colleague. Moreover, the great strides he later made in paleontology could not have occurred if all he had going for him was someone else's money. Marsh's great contribution to dinosaur paleontology is that he found dinosaurs on a grand scale. Many of the largest and most familiar dinosaurs known today, ones commonly seen in museum halls around the world, he found and named, including: Allosaurus, Apatosaurus, Diplodocus, Ornithomimus, Stegosaurus, and Triceratops. Marsh found dinosaurs by mounting massive fossil hunting expeditions to the western United States in the 1870's and 1880's. Each year, Marsh's teams would head out into the still wild parts of the western territories - what are now Nebraska, Colorado, Wyoming, and South Dakota - to find dinosaurs and other fossils, and return them to Yale's new museum for study and display. The picture at left shows members of the 1872 expedition. It is a rough-looking crew; most of the men sport breach-loading cavalry rifles, Bowie knives, and other weapons. Marsh is seen standing in the middle of the back row holding a rock hammer in his left hand. Well-armed, hard-riding men were needed because digging dinosaurs was dangerous work - this was after all, the time of Crazy Horse, Sitting Bull, and the Sioux Wars. Marsh led many of these dinosaur hunting expeditions personally. He loved the outdoor life, and he valued his time on the plains matching wits with crewmen, cavalry officers, Indians, and other frontier denizens he met there. His experience with William J. Cody, better known as Buffalo Bill, the renowned army scout, buffalo hunter, and wild west showman, is a good example. Cody, shown at left as he appeared in 1871, was assigned to scout for Marsh's 1870 expedition, but after only one day Cody was recalled to pursue a marauding Pawnee band that had attacked an army hunting party. Nevertheless, the one day together was enough to cement a friendship between Cody and Marsh that lasted the rest of Marsh's life. Whenever Buffalo Bill's extravaganzas came to Connecticut, Cody made a point of visiting with Marsh, and it was Marsh who first described to Bill the area east of Yellowstone where Bill eventually established his home, his famous Irma Hotel (which is still in operation replete with the giant mahogany bar that was a gift to Bill from Queen Victoria), and the modern town of Cody, Wyoming. Buffalo Bill, as skilled a yarn-spinner as the West produced, recognized in Marsh a man of similar talents. Bill describes their one day ride together in the following terms: "He gave me a geological history of the country; told me in what section fossils were to be found; and otherwise entertained me with several scientific yarns, some of which seemed too complicated and too mysterious to be believed by an ordinary man like me; but it was all clear to him. The professor told the boys some pretty tall yarns today, but he tipped me a wink as much as to say, 'You know how it is yourself, Bill'". Marsh reciprocated the feeling, saying of Bill in the context of describing a buffalo hunt that Marsh had carried out to obtain meat for his crewmen: "The animal selected, a young cow, proved especially fleet, and it was some minutes before I was along side, ready to shoot, in the exact manner my first guide, Buffalo Bill, had taught me long before." The years during which Marsh was digging dinosaurs in the west was a time of uncompromising strife between European Americans, who were expanding into the western territories in ever increasing numbers, and native Americans, particularly the Lakota Sioux, who traditionally inhabited these areas, and bitterly resented such encroachment. Marsh's search teams were constantly exposed to danger, but it was his 1874 expedition that nearly came to grief as a consequence of this strife. In the summer of 1874, in violation of an 1868 treaty made with the Oglalla Lakota chief Red Cloud, the US army sent a column of about 1100 cavalry under the command of Col. George Armstrong Custer, into the Black Hills of South Dakota (see map at left) to determine if the rumors of gold were true. The Black Hills are viewed by the Lakota as sacred ground, and this incursion into the center of their universe raised their hostility to the boiling point. It was into this turmoil that Marsh came in November of 1874. He wanted to dig in the fossil rich beds of what is now Badlands National Park just east of the Black Hills. To do this would require the permission of the Lakota because the Badlands were on Lakota land. Marsh met with Red Cloud and other Lakota leaders and attempted to persuade them that he wanted fossils not gold and that he would take their complaints about poor treatment by Federal Indian agents to President Grant in Washington. But the Lakotas were not convinced. Marsh's crew and the cavalry company assigned to protect them were surrounded by hundreds of well-armed Lakota warriors. In the tension of the moment, one untoward movement would have precipitated a massacre. Marsh appealed to Red Cloud, who had approved of his earlier offer of support for Lakota grievances, but there was nothing to be done but turn back. Marsh was not to be deterred, however. That night he stole a march on the Lakota by quietly advancing through their villages and riding for the Badlands. The next day they were pursued by a large war party, but, thanks to a timely warning from Red Cloud, Marsh had just enough of a head start to make his collections and return to safety. Marsh did in fact take Lakota grievances to Washington, and precipitated a scandal about corruption in government support for native Americans that reached into the White House, and eventually resulted in improved treatment for the Lakota. Red Cloud never forgot this kindness, just as Marsh did not forget Red Cloud's warning about the war party. In 1883 when Red Cloud came east to meet with federal dignitaries, he made a point of visiting Marsh in New Haven, where the picture at left was made of he and Marsh grasping a peace pipe and wampum belt. Red Cloud said of his friend, the "Big Bone Chief"; "I remember the wise chief. He came here and I asked him to tell the Great Father something. He promised to do so, and I thought he would do like all white men, and forget me when he went away. But he did not. He told the Great Father everything, just as he promised he would, and I think he is the best white man I ever saw."